The noise came from all around them. It was an ocean of whispers, rustles, and giggles, from in front and behind, above and below. The voices involved both male and female, old and young, loud and quiet. Wei WuXian could even hear a few fragmented sentences, but they came and went, not allowing him to catch any specific words. It really was too loud. Wei WuXian continued to press on his temple with one hand, and used the other to grab a palm-sized Compass of Evil from the Qiankun Bag. The pointers on the compass shakily spun two times, then started to spin faster and faster. A few moments later, it spun madly around! Last time, on Dafan Mountain, it had already been strange when the Compass of Evil didn’t find the direction. This time, it went as far as to spin all by itself, without pausing for a single moment. This situation was even more unbelievable than the pointers not moving at all! The two had already walked for a while inside the stone castle, but they hadn’t seen anyone. Wei WuXian had shouted a few times, without receiving any reply. The first stone rooms were all empty, but, as they went in deeper, in the center of one of the rooms, there was a black coffin. Lan WangJi and Wei WuXian stood on opposite sides of the coffin. After passing a look between them, they extended their arms at the same time and opened the lid. The moment the lid was opened, the noise around them suddenly multiplied, flooding through Wei WuXian’s ears in the manner of tidal water. It was as if, before this, they were secretly watched by countless pairs of eyes—the owners of the eyes silently monitored and discussed every word they spoke, every action they performed, and suddenly became agitated as they saw that the coffin was about to be opened. Wei WuXian thought of a few dozen possibilities, already prepared to fend against strong odours of rancidity, stretching claws of monsters, an overflow of poisonous water, toxic smoke that dispersed quickly, or attacks from resentful spectres. Of course, his greatest wish was to see Jin Ling. Despite this, nothing happened. Nothing. Surprisingly, this was an empty coffin. Wei WuXian was a bit startled, but also a bit disappointed at the fact that Jin Ling wasn’t stuck in here. Lan WangJi went slightly nearer. Bichen unsheathed by itself for a few inches, its cold light shining on the bottom of the coffin. Only then, did Wei WuXian notice how it wasn’t that the coffin was empty, but that the object inside was a lot smaller than what he had expected, and hid inside the deepest part of the coffin. Inside the coffin, there lay a long sword. The sword had no sheath. The hilt seemed to have been casted from gold, appearing to be quite heavy in weight. Its body was slender and its blade shone. Resting on a layer of red cloth at the bottom of the coffin, it reflected a bloody shade of scarlet, emitting a chilling air of destruction. A sword was put inside a coffin instead of a corpse. There really wasn’t anywhere not peculiar about these stone castles in the Xinglu Ridge, revealing mysteries every step they took. The two closed the coffin lid and continued walking. They found other coffins like this in some other rooms. Looking at the texture of the wood, their ages were all different. And, within every coffin, there was a long sword. Even until they went inside the last room, there still wasn’t any trace of Jin Ling. Wei WuXian closed the lid of the coffin, feeling slightly worried. Seeing his knitted eyebrows, Lan WangJi thought for a moment, put the guqin horizontally on the coffin, and raised his hand. A melody poured from his fingers. He only played a short excerpt, and then took his right hand away from the guqin. He stared attentively at the still-vibrating strings. Suddenly, the strings quivered, and one note sounded on its own. Inquiry was a famous piece composed by an ancestor in the GusuLan Sect. Different from Evocation, it was used when the victim’s identity was unknown and there wasn’t a medium. The player used notes of the guqin to inquire, asking questions to the victim, while the victim’s answers would be transformed into melodies by Inquiry and shown on the strings. If the strings vibrated on their own, it meant that Lan WangJi had already brought a spirit in the castle here. 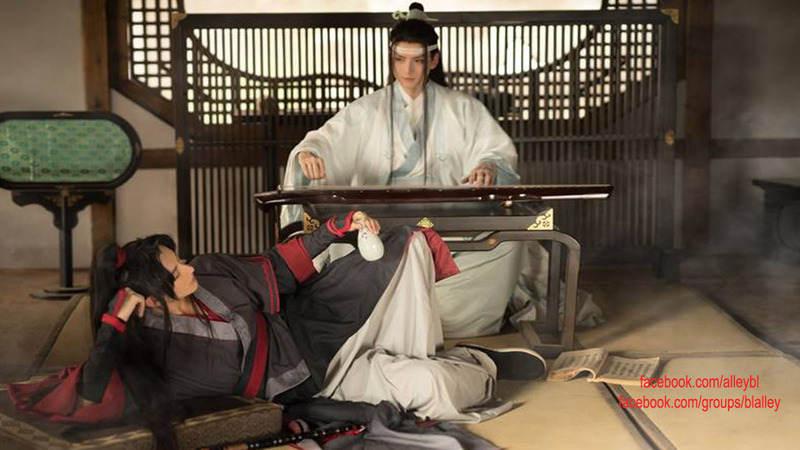 After this, the two would start asking and answering using the language of the guqin. “…” Wei WuXian looked at him, suddenly remembering a conversation about “whatever” a few years ago. Touching his nose, he was at a loss for words, and thought, Lan Zhan is so bright. He even learned how to make me speechless. Lan WangJi raised his hands to play another phrase. Yet, the answer was the same two notes— “I don’t know”. Wei WuXian’s expression changed as well. The soul that “Inquire” had found was Jin Ling?! He listened intently. Amid the noise that seemed to have bombarded here, there really seemed to be a few weak shouts coming from Jin Ling. They were faint, however, and indistinct. Lan WangJi continued to ask. Wei WuXian knew that he was asking for the precise location, so he stared fixedly at the strings of the guqin, waiting for Jin Ling’s answer. Without saying a word, Wei WuXian turned toward the southwest. Behind him came seven notes of the guqin, so he walked seven steps forward. However, nothing had appeared in front of him. After the sixth step, the guqin finally silenced. No more notes sounded. And, before him, there was only a wall. Bichen unsheathed. Four streaks of blue light swept past, and a neat pound sign had been carved onto the wall. The two went forward to take apart the bricks. After removing some of them, a large sheet of black dirt was exposed. It seemed that the stone castle was made to be double-layered, filled with dirt between the two layers of hard rock. Using his bare hands, Wei WuXian dug out a large chunk of dirt. Surrounded by the coal-black dirt, there was a human’s face, eyes tightly shut. It was the missing Jin Ling! Having his face enveloped in dirt, as soon as it appeared, air poured into Jin Ling’s mouth and nose. He immediately started to cough and breathe. As Wei WuXian saw that he was still alive, his heart finally calmed. Jin Ling really did almost die. Or else, “Inquiry” wouldn’t have caught the still-alive soul that was about to leave his body. The good thing was that only a short while passed after he was buried into the wall. If it took them any longer, he would have suffocated to death. The two hastened to dig him out of the wall. However, who knew that, as if dirt clung onto a carrot being pulled out of the ground, the moment Jin Ling’s upper body emerged from the dirt, the sword on his back caught on something else and dragged it out. It was the ashen bone of a human arm! Lan WangJi laid Jin Ling flat onto the ground and felt for his pulse. Wei WuXian, on the other hand, took up the sheath of Bichen, and skillfully started to poke around in the dirt, following the length of the bone. After a short while, a complete skeleton appeared before their eyes. This skeleton was the same as how Jin Ling looked, buried inside the wall in a standing position. With ghastly pale bones and pitch-black dirt—the contrast was distinct yet glaring to the eye. Wei WuXian dug a bit more through the ground, and broke away a few pieces of bricks on the side. After some more rustling around, sure enough, he found another skeleton nearby. This one hadn’t decayed completely yet. There were still some flesh on the bones, and long, messy hair on the skull. From the ragged clothing in the shade of a watered down red, he could tell that this was a woman. However, she wasn’t standing, with her skeleton bending down. The reason of this was that there was a third skeleton beside her, squatting down by her feet. Wei WuXian stopped digging further. He took a few steps back. The noise in his ears was as wild and turbulent as tidal waves. He could almost be sure of it. The inside of this stone castle’s thick walls was packed with human corpses. Just what on Earth was this place?! Sword: Although this was translated as a “sword”, the Chinese character of this is different from that of a sword’s. The character used here means “knife.” The difference between a “sword” and a “knife” is that the first attacks by stabbing, while the second attacks by slicing or chopping. However, they both look like a “sword” in Western standards.